A Needle in the Chest: An Evidence Based Failure? 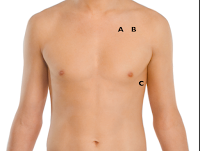 "The Gist: Needle decompression for tension pneumothorax should be taught at the fourth or fifth intercostal space at the anterior axillary line (4/5ICS AAL). Note: This post will not detail critiques that needle decompression may be overused or the needle vs thoracostomy debate. Historical teaching instructs providers to place a needle in the second ICS at the mid-clavicular line (2ICS MCL) for tension pneumothorax. Free Open Access Medical Education (FOAM) sources such as Emergency Medicine Ireland have preached the more lateral approach for years; yet this teaching has not spread widely (outside of military circles where there seems to be better adoption). Change is difficult, particularly when it involves re-educating thousands of providers and it seems like this is the primary driver behind the 2ICS MCL remaining as the typical site for needle decompression.. However, several potential problems exist with the mid-clavicular approach that warrant consideration for assuming 4/5ICS AAL as the primary initial placement for needle decompression."